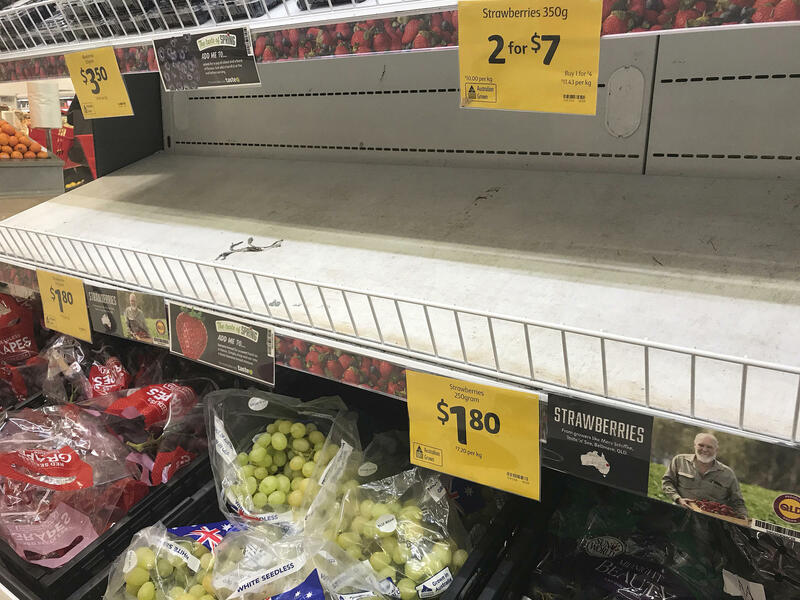 Empty shelves, normally stocked with strawberries, are seen at a Coles Supermarket in Brisbane, Australia. Strawberries contaminated with needles have been reported in Western Australia, South Australia, Queensland, Tasmania and New South Wales, Australia's ABC broadcaster reported. At least seven brands of strawberries have been affected, ABC added. Australian Minister for Health Greg Hunt said he has now ordered Food Standards Australia New Zealand to "investigate the handling of strawberry contamination." He urged consumers to be vigilant – but added that strawberries are safe to eat after washing and chopping. "This a vicious crime, it's designed to injure, and possibly worse, members of the population at large," said Hunt, according to ABC. He said that while police have primary responsibility, the federal agency is investigating "whether there are supply chain weaknesses." Nobody has yet been reported injured, according to The Associated Press. But the reports are alarming. For example, according to ABC, on Saturday a 7-year-old girl in South Australia bit into a strawberry that had a needle in it. She was unharmed. The contamination was first reported in Queensland, where the government is offering a $100,000 reward (almost $72,000 in U.S. dollars) for information. "Whoever is behind this is not just putting families at risk across Queensland and the rest of Australia – they are putting an entire industry at risk," Queensland Premier Annastacia Palaszczuk said in a statement. The contamination scare could have sweeping consequences for the major industry in Australia. "I'm angry for all the associated people, it's the farmers, the people who supply them, the packaging people, the truckies with families to support, who suddenly lose their jobs ... it's far-reaching," Queensland Strawberry Growers Association vice president Adrian Schultz told the AP. Farmers are dumping large quantities of the fruit, including "more than 20 tonnes" in Western Australia alone, according to Perth Now. "We want to highlight that without immediate consumer support, the industry will be forced to abandon their crops or continue dumping fruit and we may not have a strawberry industry next year," Strawberry Growers Association of Western Australia vice president Paul Da Silva told the news site. Many growers are installing metal detectors to scan their fruit at the request of retailers and insurance companies, according to ABC. It's not totally clear whether the incidents are all connected, or whether some are copycats. Police in Queensland believe the discovery of a "thin metal object" in a supermarket strawberry basket last week was likely a copycat incident. They also said Monday that a 62-year-old woman in Maryborough was given a warning by police after the "alleged contamination of a banana within a local supermarket."